here is is, finally a blog from Joe! I have been asked several times why I haven't written anything since we left Texas. Well, there are a lot of reasons, mainly just being very busy. I also kept putting it off because I wanted to get some pictures of me working. Finally with the help of my wife, I was able to do so. My job has changed a bit since we arrived on the ship, but I will start at the beginning. I started as the Vehicle mechanic for the transportation department. 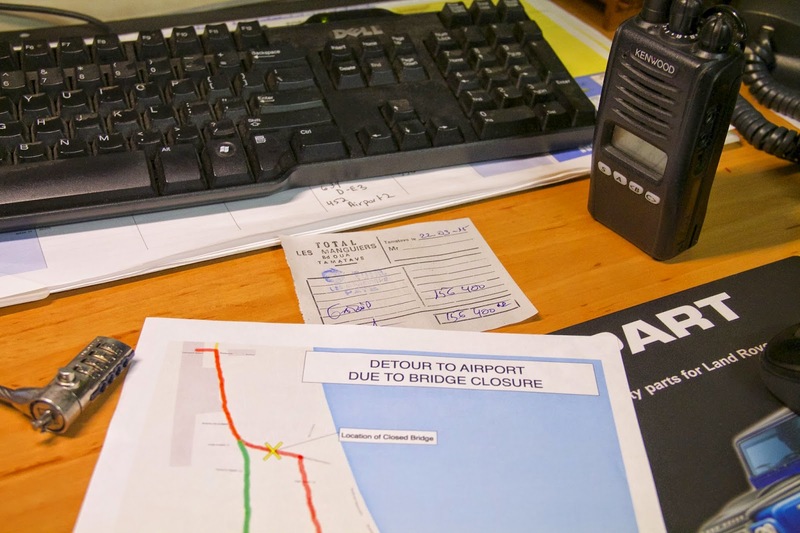 The department consists of a transportation manager, vehicle mechanic, and an administrative assistant. 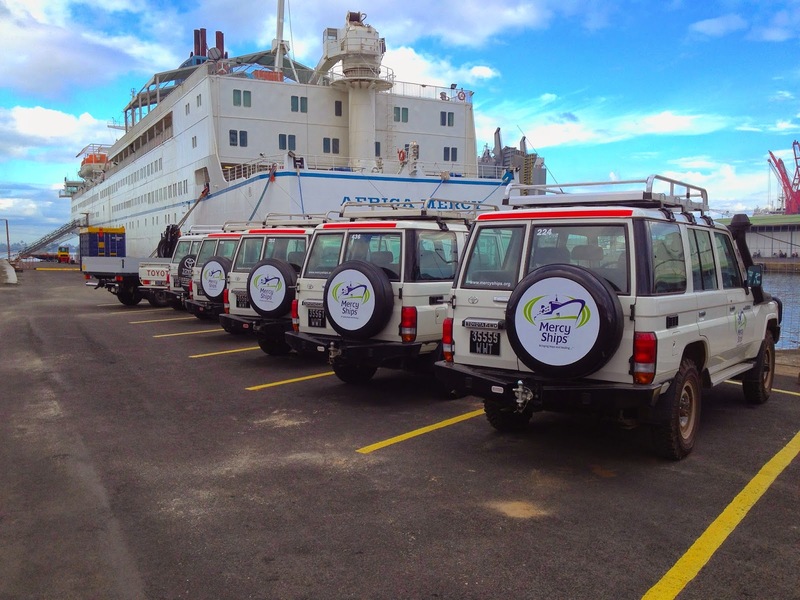 On the ship we carry 24 vehicles from country to country to help support the mission. 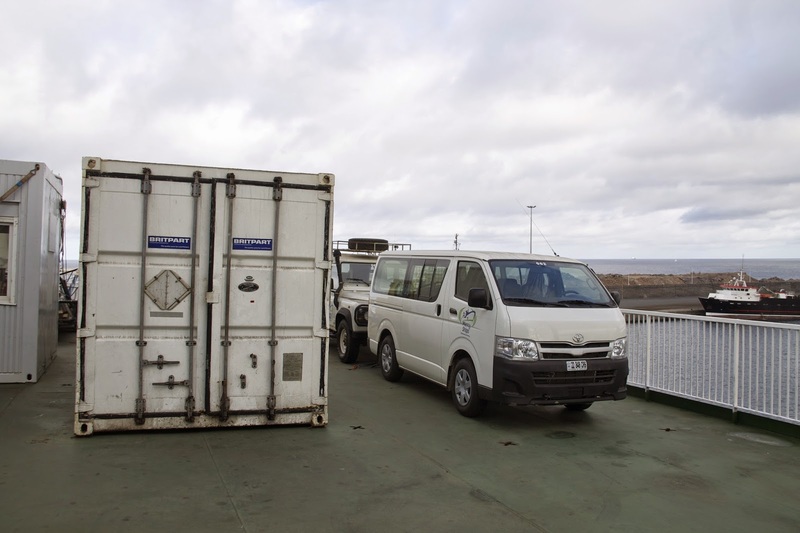 Each year several new vehicles are sent to the next country to assist the advance team and then join the rest of the vehicles when the ship arrives. 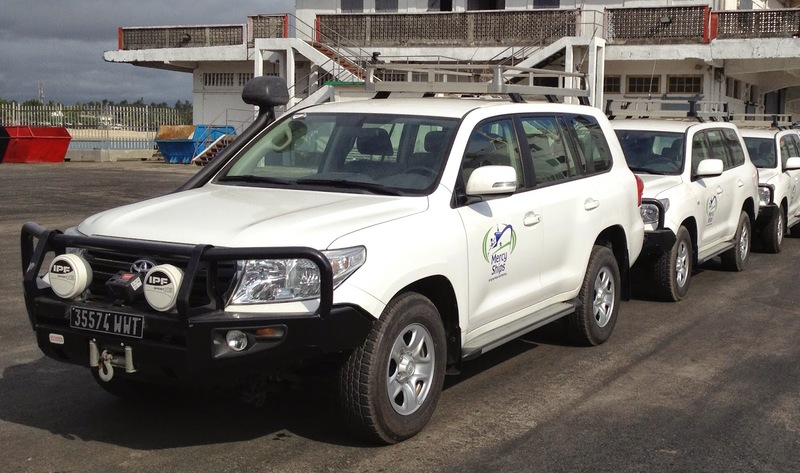 This gives us the availability of around 27 vehicles while we are in a country. This also means that each year when we leave a country, we need to sell a few of the oldest vehicles since we can only carry 24 on the ship. So how do you get 24 vehicles loaded on a ship??? Several years ago this was how it was done. I am told it could take over 30min per car and very difficult to set up. Now it is a bit different, and much easier. A special 20ft shipping container is landed on the dock using the ship's aft crane. The container has doors front and back, as well as on the sides. 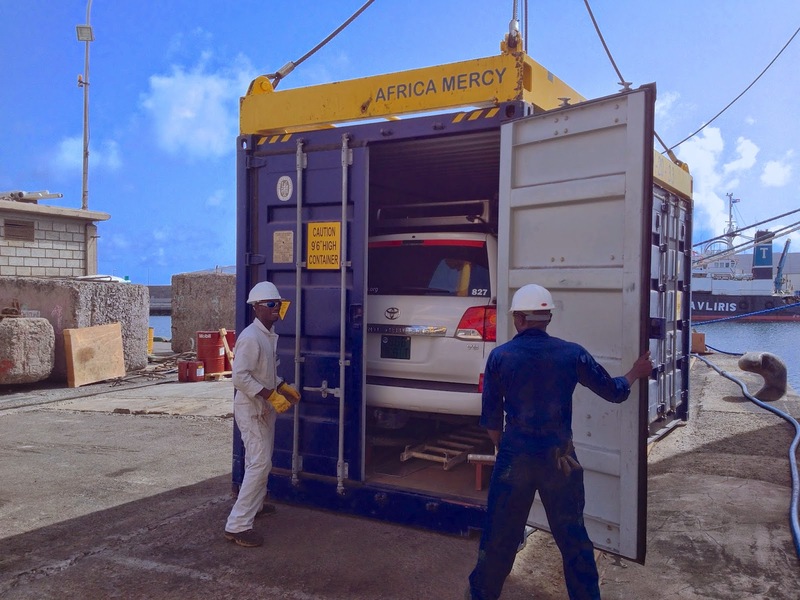 The car gets driven into the container using a set of small ramps. The driver then exits through the side of the container. The doors are closed and the container is lifted up to deck 8 of the ship. A second driver, stationed on deck 8, enters the side of the container. Then the other end of the container is opened up(you don't even have to back out! )and the car is driven out onto deck 8. It is a bit tight maneuvering the cars around on deck 8 but once they are all in their specific places they are strapped down so they don't move. 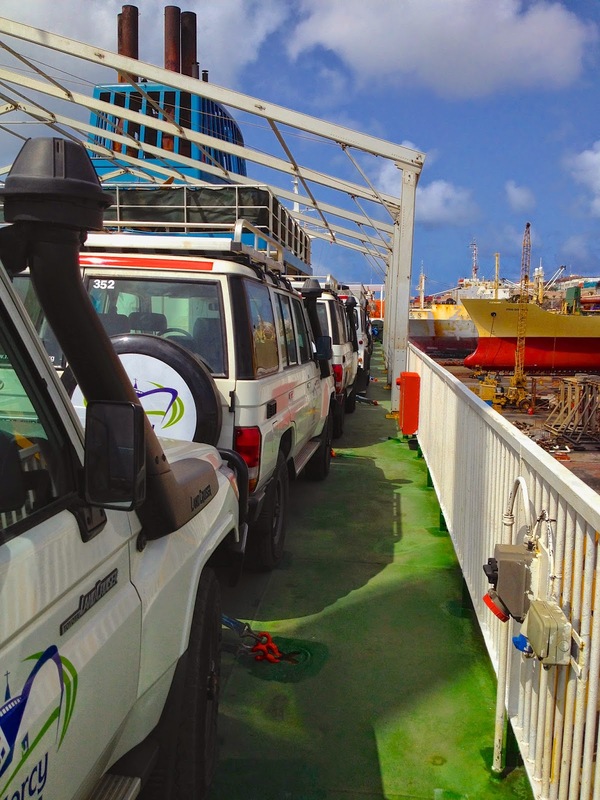 From the dock to deck 8 or deck 8 to the dock, we can do it in 10 minutes per car. It seams like a lot of cars, but they are needed. There are so many different programs going on that almost all our vehicles are working hard every day. These jobs include: transporting patients, transporting crew to various off ship locations, transporting supplies to the ship, taking doctors and nurses to local hospitals, working with local ministries, moving vital supplies to various off ship projects and programs, etc. The list goes on and on. This also means that the fleet needs to be pretty versatile to adapt to many tasks and especially many different terrains. 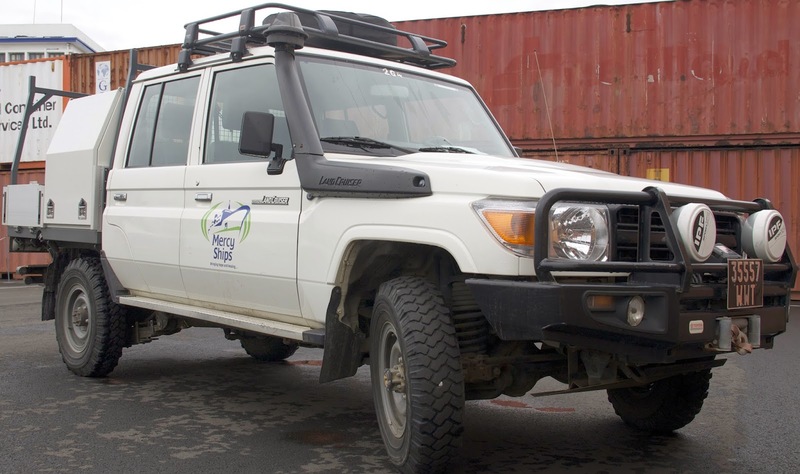 We have 3 Toyota Land Cruiser 200 series wagons that are used media teams, VIP transportation, etc. They are nice enough for a smooth ride, but still tough enough to stand up to the extreme climate and terrain of Africa. 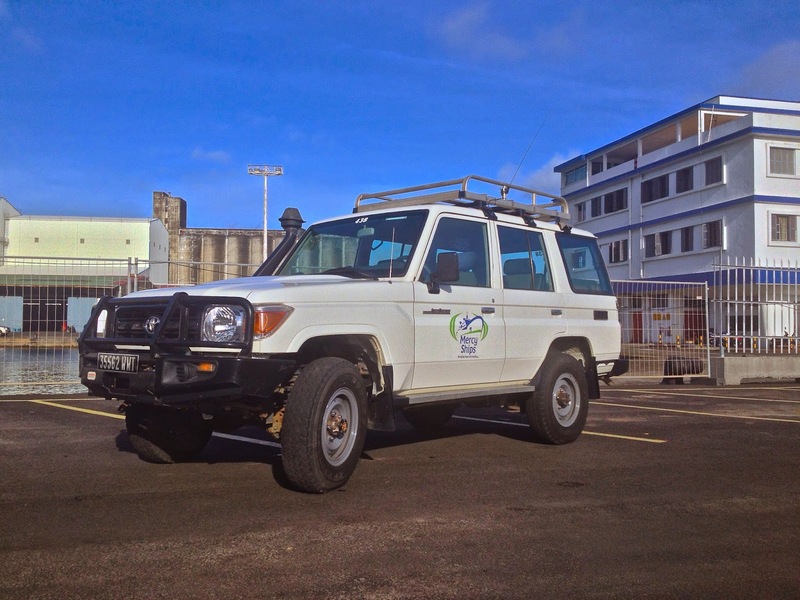 Our other Toyota Land Cruiser is the 70 Series. 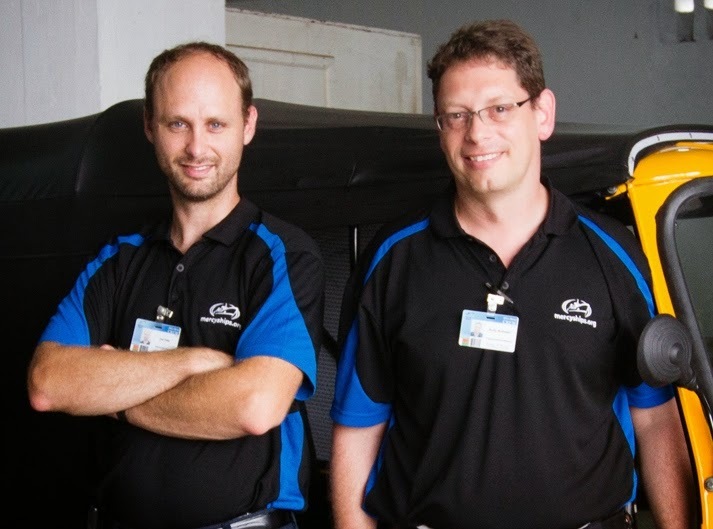 They are all powered by a 4.2L inline-6 diesel engine that Toyota has been producing for over 25 years. All mechanical fuel injection, no computer, easy to fix anywhere, run forever. It is our new, all purpose, standard vehicle. We now have six of these in our fleet. 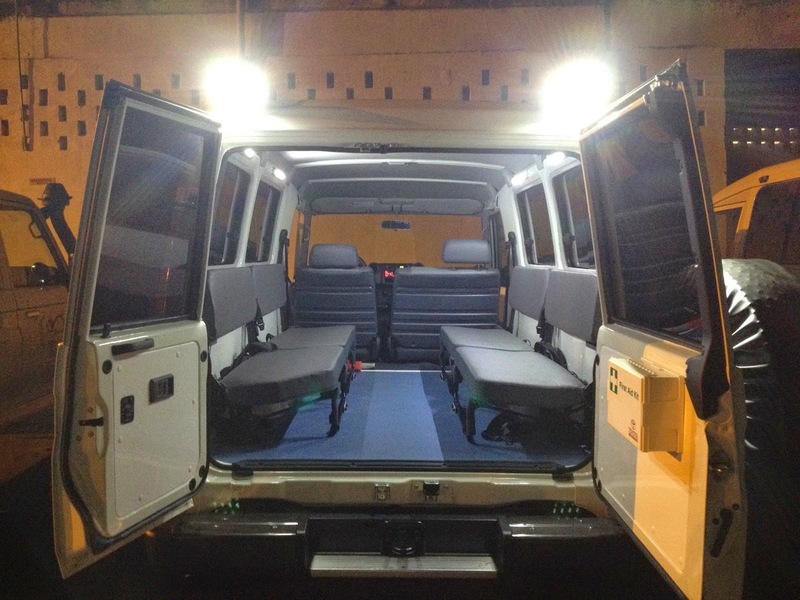 It seats 10 passengers, is extremely durable, and does well off road. 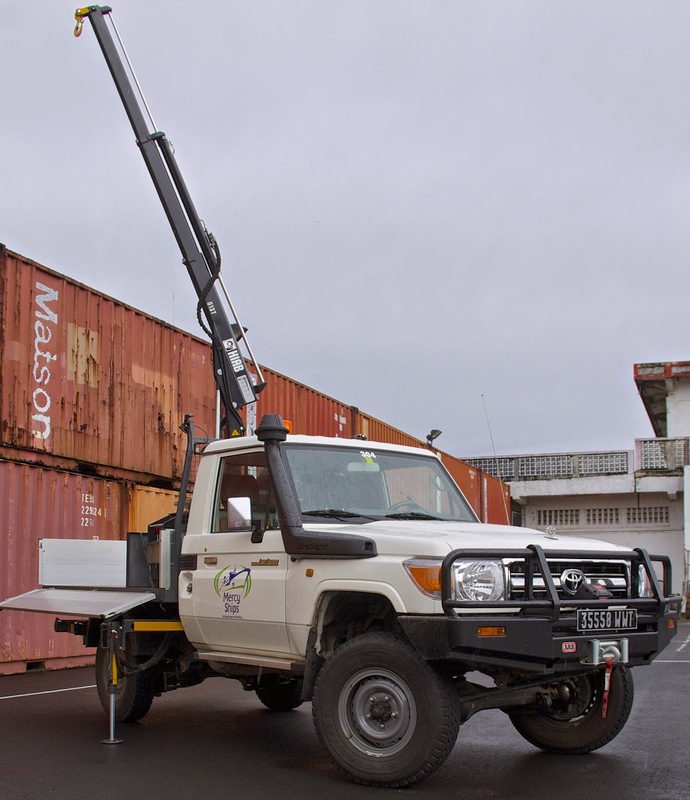 This is a single cab pickup truck that has been outfitted with a small hydraulic crane. This was custom built to deliver supplies and tanks of clean water to remote locations while also having the capability of unloading them. It also doubles as our transportation department service truck. 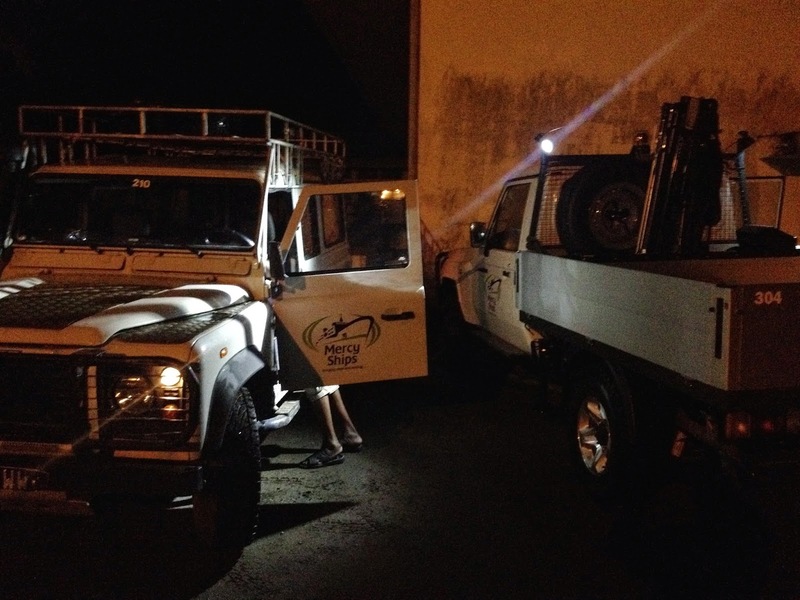 It's LED flood lights are essential to repairing vehicles on the side of the road after dark. This truck used to have an ordinary pickup bed, but just recently we installed a custom made utility body that can securely hold tools and even has a power inverter for charging batteries for power tools. This is a two door version of the LC76 wagon and just a bit longer. It has seating for 13 people with 10 in the rear on long bench seats. These can be folded up to accommodate a stretcher. We now have three of these. 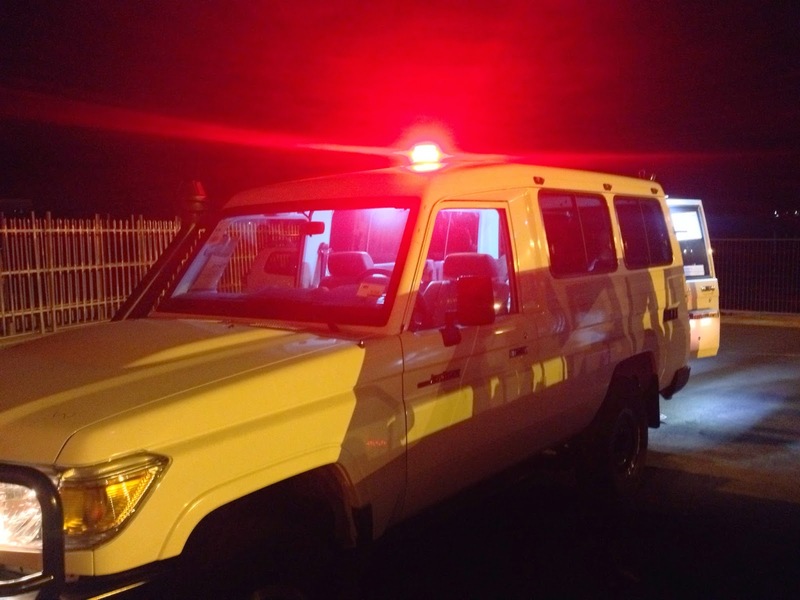 One is used for transporting crew to and from the airport. The other two are used as patient transport vehicles. I will say, without hesitation, it is the best off road vehicle, ever made. It is amazing how they will just crawl through deep sand. An aluminum body, 4 cylinder turbo diesel, coil over rear suspension, and a center diff lock, they are truly amazing. However, they have many problems and constantly break down. They are also extremely difficult to work on and with the addition of their all electronic computer controlled diesel engines over the last few years they are not very easy to fix or find parts when used in remote locations. One of the most difficult things in my opinion is having the necessary parts in stock to fix the vehicles. We can ship parts from Europe and get them in a few weeks, but it is very expensive and is only used when absolutely necessary. The preferred method is to have parts sent on one of our containers that gets shipped from the Netherlands every month. This is much cheaper, but it is almost 4 months from when I place a parts order, to when I get the parts. It's a lot different than just calling Napa or Auto Zone. The great thing about Toyota though, is that pretty much anywhere in the world that you are, there is a Toyota dealership. There is even a Toyota dealer right here in Tamatave, and I have been able to get most any Toyota parts that I've needed. We still prefer to be ready, and stock the parts. Especially since they are much cheaper to get from our suppliers in Europe. 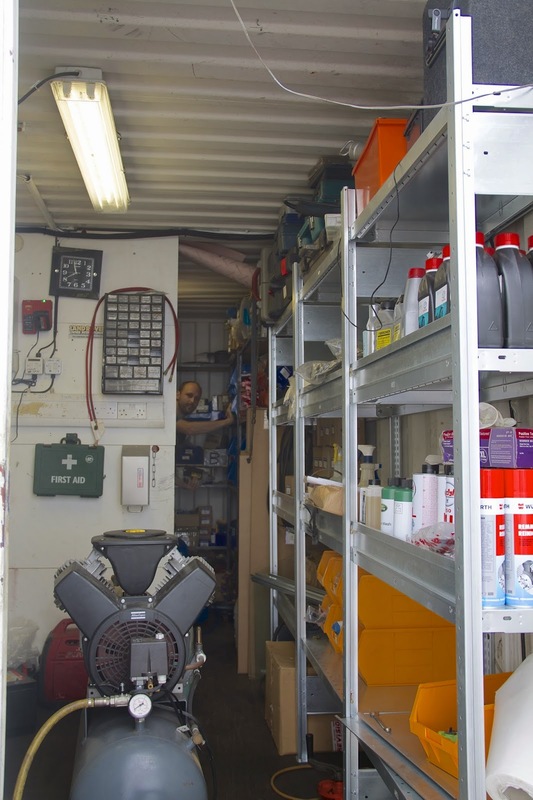 This is why we keep our own shipping container full with parts, tools, and supplies to properly service our fleet. When the ship gets to a country, everything begins to on fold and setup. We basically setup our own auto shop on the dock, with the capability of doing everything from oil changes to complete engine rebuilds. In Madagascar we have been extremely blessed to have an old warehouse on the dock to use. Normally the vehicles are repaired under a tent on the side of our parts container. With the warehouse, we were able to set up our own small "garage" to perform repairs. Another very important job is keeping the vehicles clean and rust free. 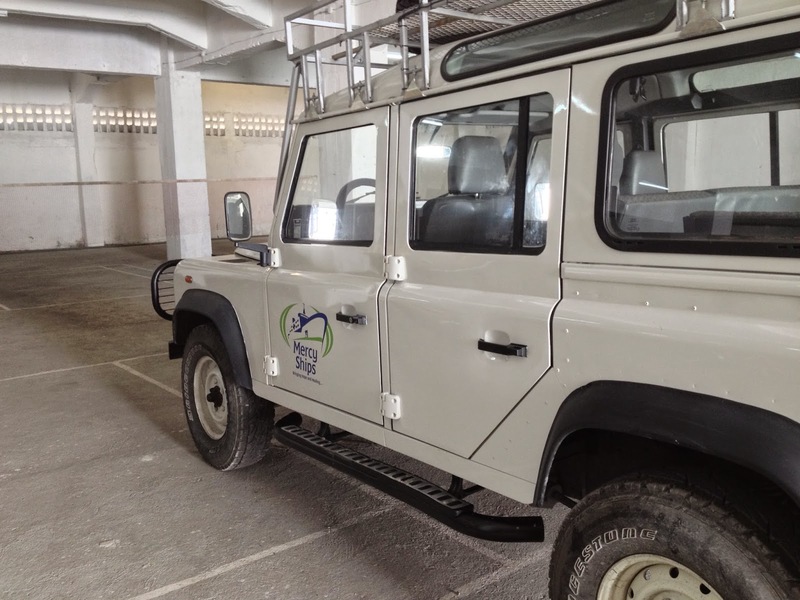 With all of the off road driving and being near the salty ocean air, the vehicles need to be washed once or more per week to keep them in good condition. Since our tent didn't need to be used for the mechanic's bay, we set it up over the car washing area to give the guys washing the cars some much needed shade. This is a lot of work, and there is no way that a department of only 3 people could accomplish this. This is why when the ship comes into a port, they employ over 200 local day workers. In transportation this year we have 11 that wash cars, drive patients and crew, and help with general transportation needs. As we sailed towards Madagascar, and after being delayed for over 2 months, I was excited to see our department get to work. 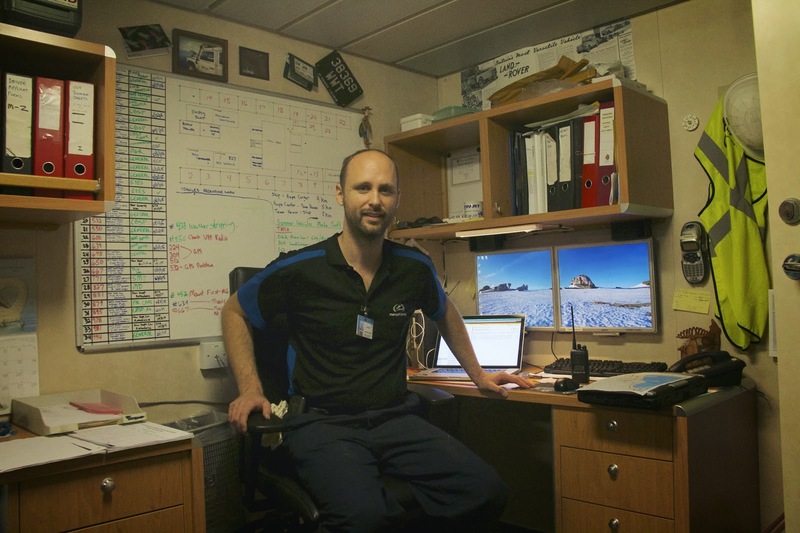 My boss Andrew, the transportation manager, was asked to fill a different position on the ship that was in need. This meant that I would move up to be Transportation Manager. I didn't have a problem with doing this, but at the same time, it is difficult to set everything up and train local workers without ever seeing the how the whole process worked before when the ship serving is in an African country. I accepted the challenge. Starting Dec. 1, 2014, I would officially be the transportation manager. Dec. 1 was the official date, but I started taking on more and more as soon as we arrived in Madagascar, as Andrew was busy with a temporary assignment of Vessel Transition Coordinator. Luckily he was always there for me to ask questions, and still is. I did however, get to upgrade to having 2 bars on my uniform! If I am the now the manager, who will be the mechanic? We had no one to fill this position. 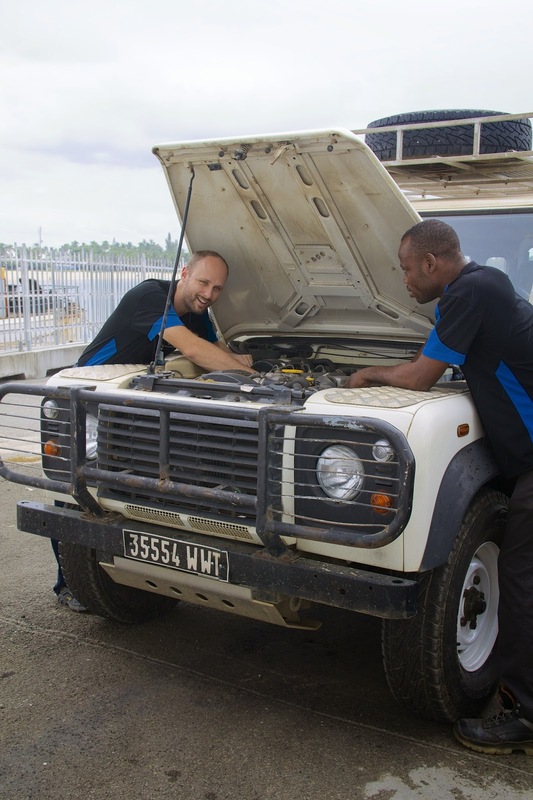 The plan would be to find a local day worker to work on the cars, but this turned out to be a very difficult challenge as there are not many cars in the town that we are docked in, thus not many qualified mechanics. I ended up performing all of the repairs on the vehicles by myself which made for a very rough first few months. With trying to manage the department and 11 day workers, the only time that I could find to perform vehicle repairs was if I worked after hours or on the weekends. This took a lot out of me. Finally by mid January relief arrived! 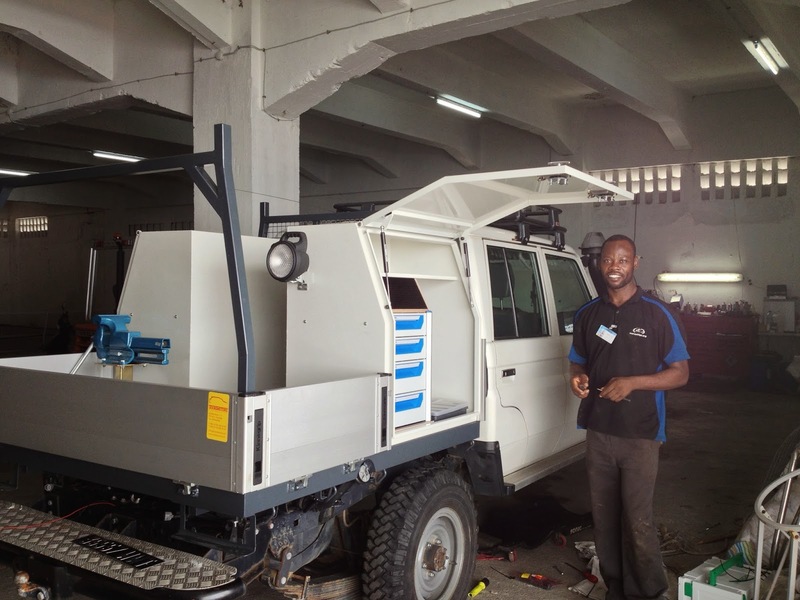 A mechanic named Mathieu, from Togo in West Africa, would be coming for 3 months. 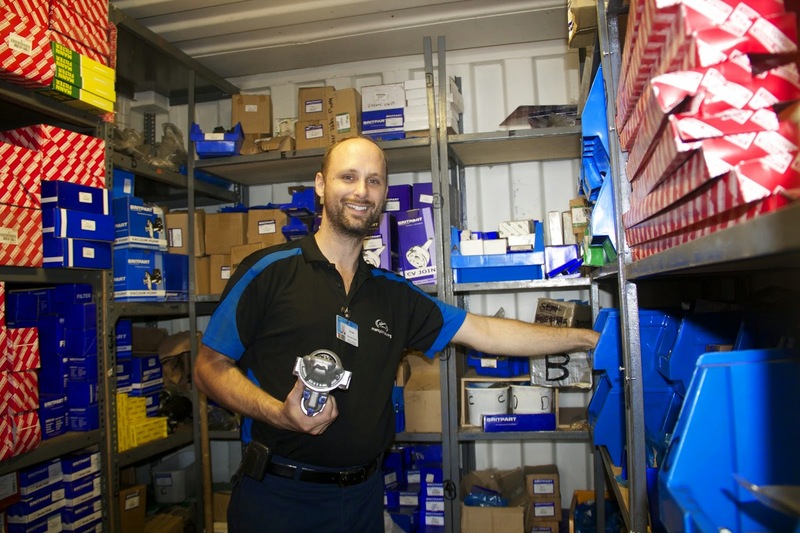 Mathieu had worked as a dayworker mechanic for Mercy Ships for many years in multiple West African countries. 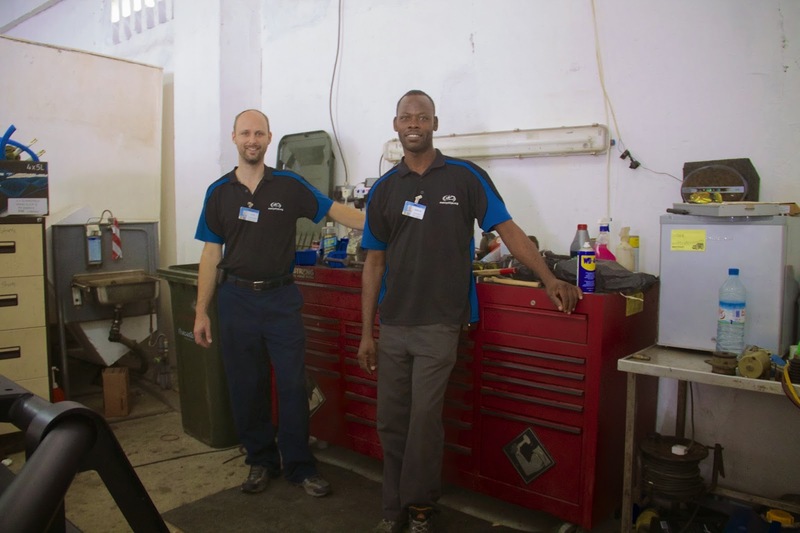 I was told that he is an absolute pro when it came to working on our vehicles and with his previous experience with Mercy Ships, he would easily slip right into work. This turned out to be more that true. Mathieu is one of the best, hardest working mechanics that I have ever worked with. It is such a blessing to have him here. His time has also been extended! It has been approved for him to finish the field service here and sail with the ship to South Africa and he will fly home from there. This has allowed me to really concentrate more on my duties as Transportation Manager. This relief came with perfect timing as this field service has much more going on then usual. 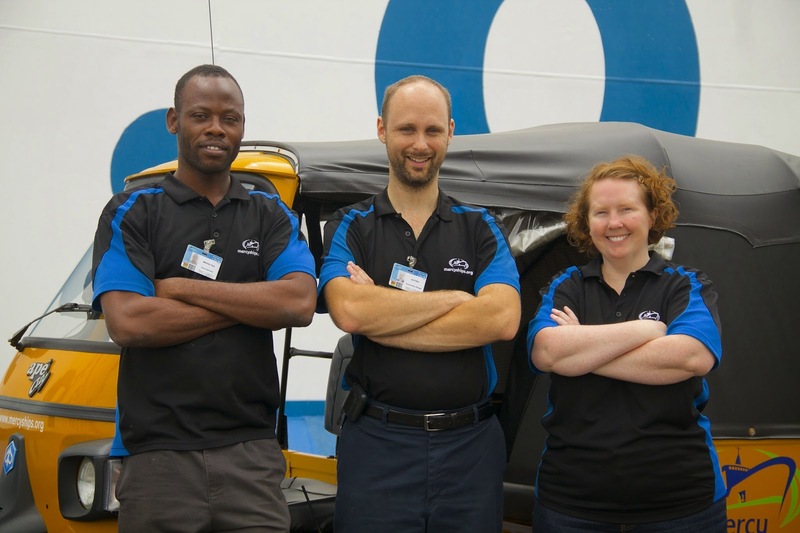 Our 3 new cars for this year arrived back in December from Benin(that is where the ship was originally scheduled to go). 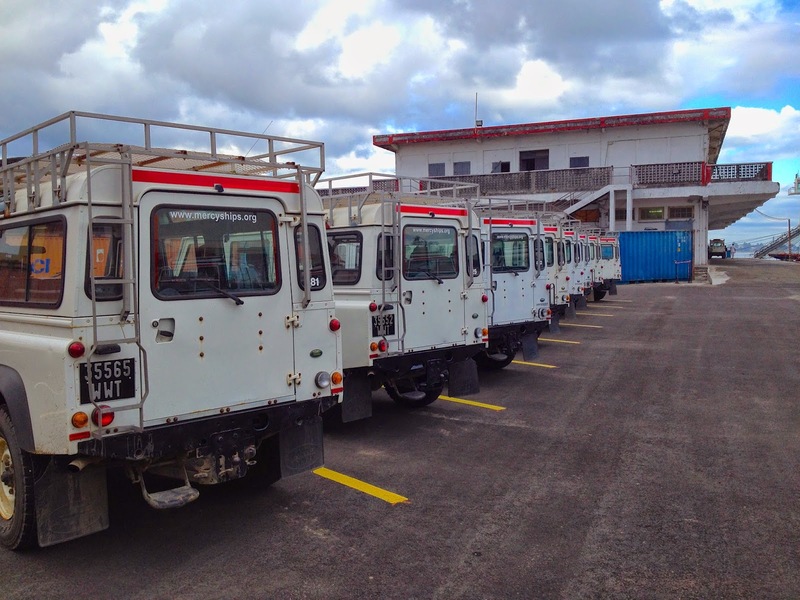 Since we are coming back to Madagascar for a second field service in August, our next lot of new cars(5 this time!) was sent directly here early(because normally they would go to the next country that we are going to). Also, because we are expanding our usual programs, more vehicles will be needed. Therefore, we will not sell all of our old vehicles, only two. This brings our fleet up to 30 cars. 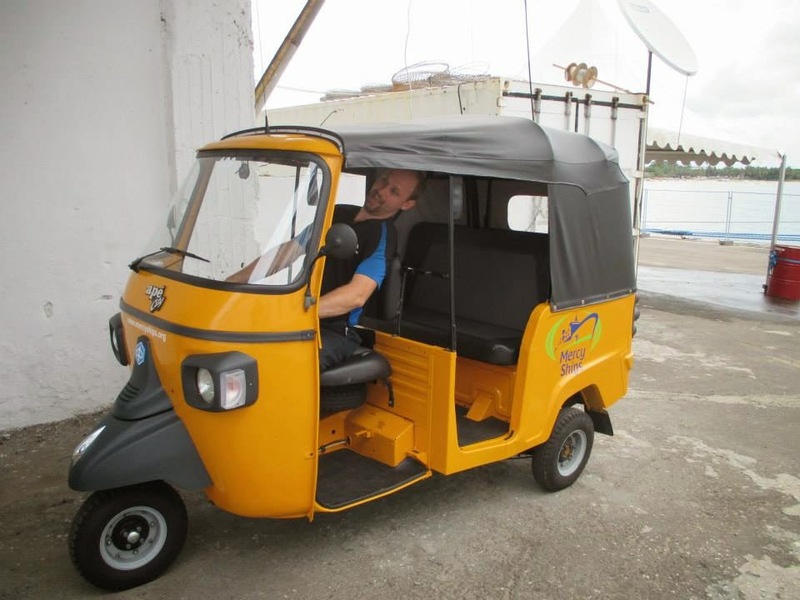 Some of our cars are available to be used for personal use outside work, although crew members do need to pay a per kilometer fee to cover fuel and expenses. This is truly a wonderful blessing, but not all of our crew members are allowed to drive the cars. Being an approved driver, is for crew members who are required to drive for their job on the ship. Out of 350+ crew on board, only just over 100 are approved drivers. The rest of our "non driver" crew members will coordinate with drivers to get around town or take the many forms of public transportation. Unfortunately the public transportation here in Tamatave can not come into the port and it is a 15min walk from the ship to the port gate. This is not a bad walk, as the port is very nice(clean, safe, sidewalks, street lights, etc. ), but it can be rough in the rain, under the blazing sun, or when carrying heavy bags. To solve this problem, in other ports we have setup a shuttle, to take crew members from the ship to the port gate and back. This works out ok, but is a lot of unnecessary wear on our big 4-wheel drive vehicles, not to mention the fuel. Back in November we were trying to think of a better vehicle to run shuttles with, and someone proposed a great idea. You know that saying "When in Rome, do as the Romans do"? Well that's what we did. 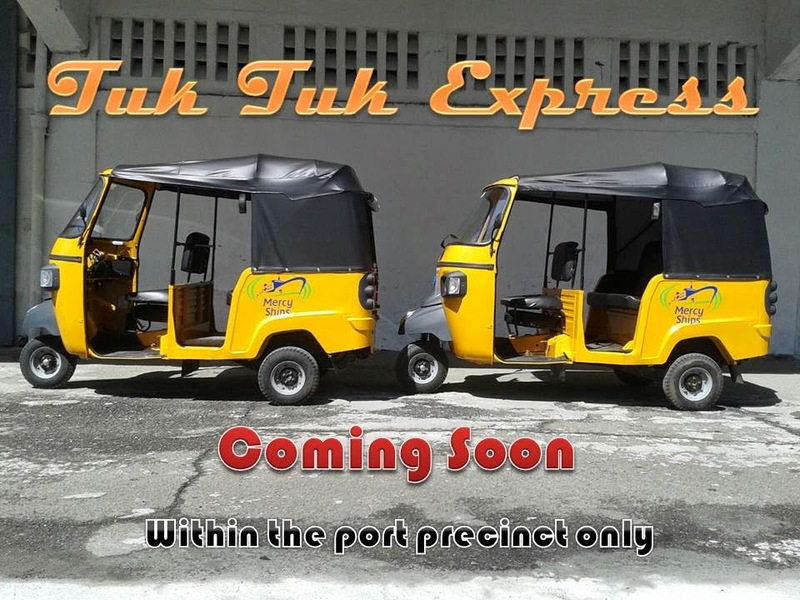 Here in Tamatave, they have 3 different types of "rickshaw" like transportation. One is the traditional with a man running pulling a chariot on 2 wheels, another is a bicycle type, and the third is a three-wheeled motorcycle type that carries 3 people in the back seat called a tuk-tuk(pronounced took-took). 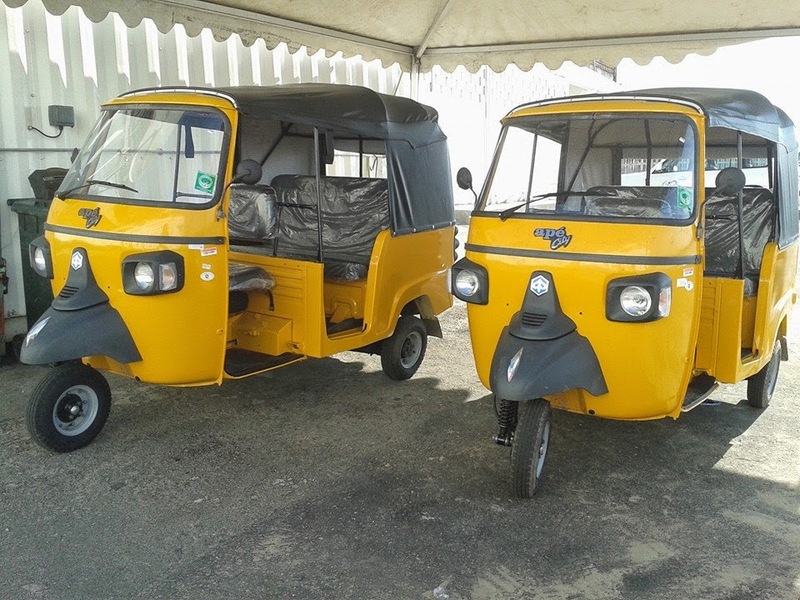 After running the numbers and doing some research and negotiating, we purchased 2 of our very own tuk-tuks. 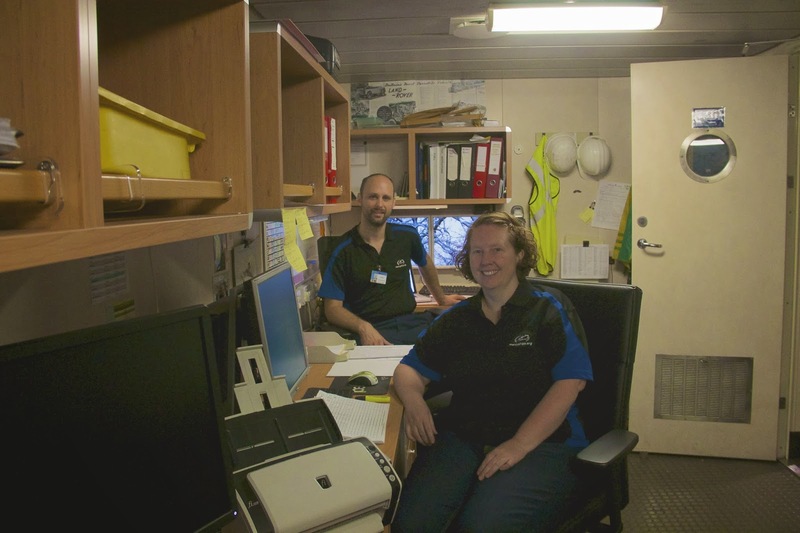 We then hired 2 local day workers to drive crew members to and from the port gate from the ship. At a fraction of the cost of using our Land Rovers we were able to go this route. the cars would not be running and we would all be walking. Without Jodie's administrative help, all of the vehicle bookings would be a mess, people would be fighting over cars, and all of our paperwork would be lost. I could not do it without them. It is getting close to the end of the field service here in Madagascar and in June the ship will be sailing away for Durban, South Africa to go into dry dock for maintenance and repairs. However, Jess and I will not be sailing. We will be leaving here on May 12th and heading to Durban early. We have been asked to be the advance team. We will be preparing for the ship's arrival and will join the ship when it arrives on June 15. We are very excited for this new challenge. Please see the last blog that Jess wrote for more details on what we will be doing. Well, I think that is enough for now. Nice to see a new blog from you! Great pictures! Good luck with your new assignment in Durban! Excellent blog post Joe. Loved all the information we never get to hear about back at the IOC. Thanks for taking the time to share. Thanks Ted! Please pass this around to whoever there may want to see it! What a great story and I really like the pictures you added to the blog. That new job is very similar to what my uncle does. He works for a freight company in the east. He tells us all these stories all the time and it made me think of him while I read this blog. Keep it up. Thanks. 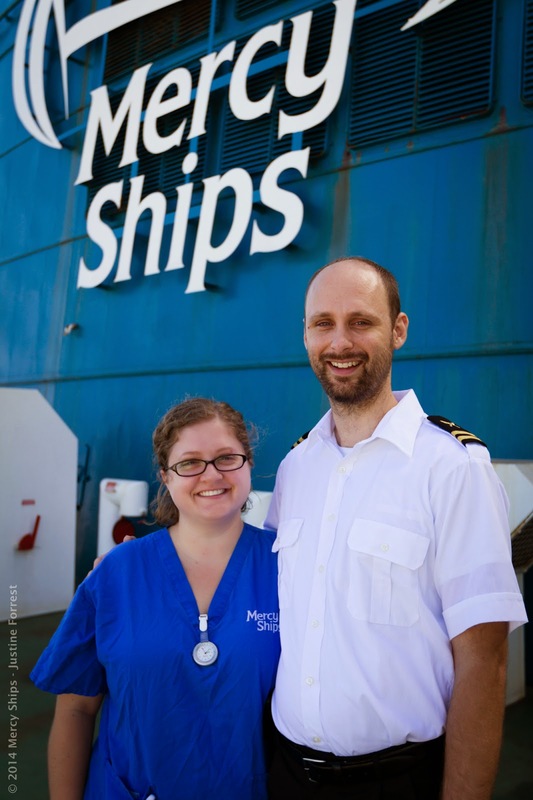 Joe and I are currently serving God through Mercy Ships. 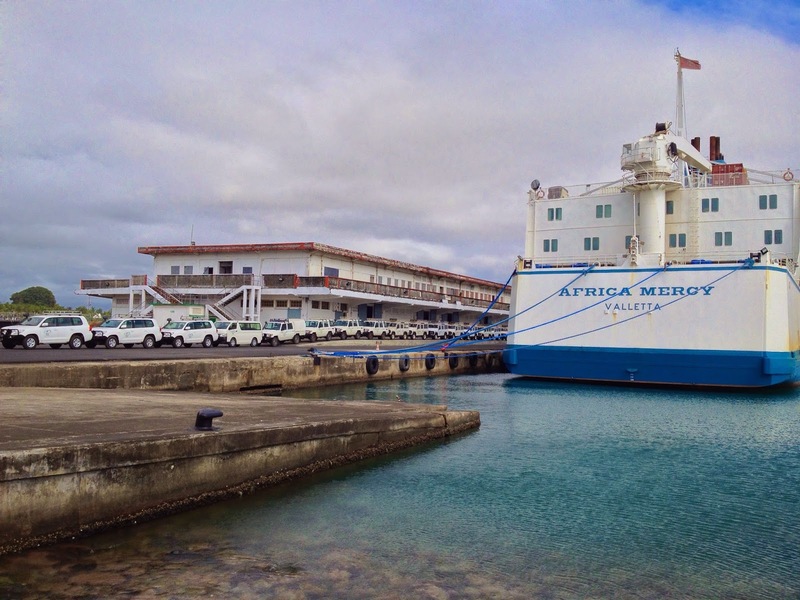 We arrived on board the M/V Africa Mercy on 3 August 2014. We are scheduled to return home late November 2016. The ship is a floating hospital, providing care to the poorest nations. Due to the Ebola outbreak in West Africa, the ship is in Madasgascar. 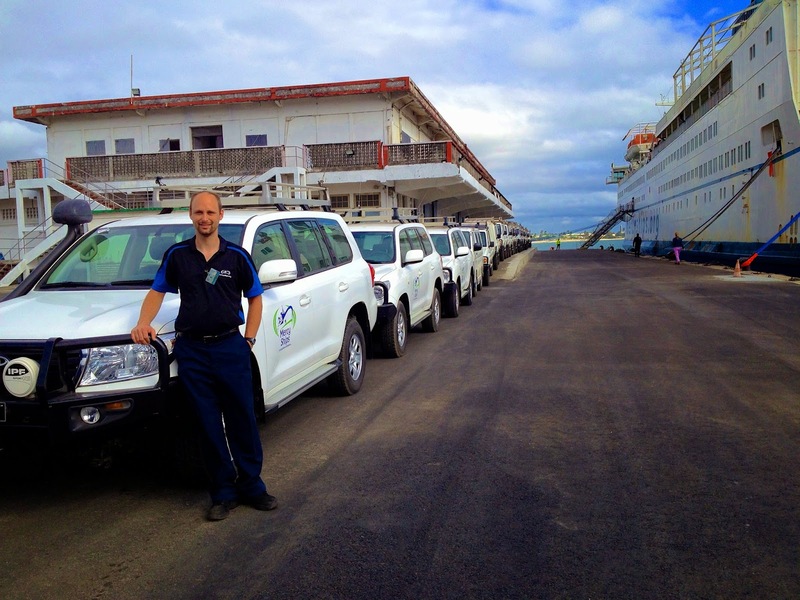 The ship will be returning to West Africa for the 2016-2017 field service. I am privileged to work as a Ward Nurse, and Joe is the Transportation Manager. 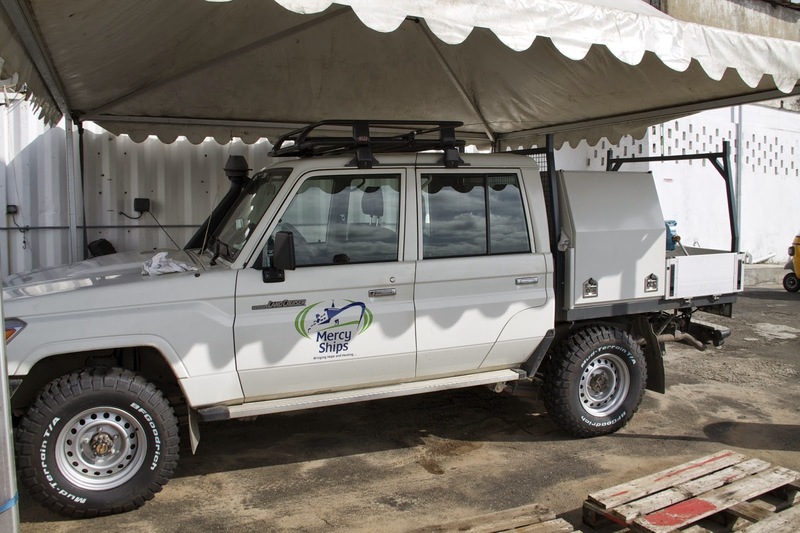 The ship does have vehicles it uses to go into the country to further serve and help people, doing such things as agriculture and nutrition projects and dental clinics. Although we are currently serving with Mercy Ships, everything communicated here strictly reflects our personal opinions and is neither reviewed nor endorsed by Mercy Ships. Opinions, conclusions and other information expressed here do not necessarily reflect the views of Mercy Ships.